Is the gerbil life tiring you out? Need a rest from the rat race of being a gerbil? If you’re in need of a good long vacation from the daily grind of eating, running, twitching, eating, running, twitching, jumping, running, shredding, chewing, twitching and eating, we have a great deal for you. Rodentia Travel Dreams is offering week-long vacations at The Gerbil Tree House. With all the modern amenities today’s busy gerbil needs in a naturalistic setting that’s a throwback to the days gerbils lived free, this tree house is a favorite for busy gerbils everywhere. Set inside a bushy, leafy tree*, the Gerbil Tree House is cozy and comfortable, decorated with a simple leafy-neon-psychedelic rug on the cardboard floor. This tree house comes equipped with two entrances: a main entrance and a side entrance. You can run in through the main one, and out the side one. For some excitement, try going in through the side entrance and leaving through the main door. Not a jumper? Each entrance has its own ladder with safety steps for gerbils who are a little unsteady on their paws. Concerned about tooth growth while on vacation? No need to worry. 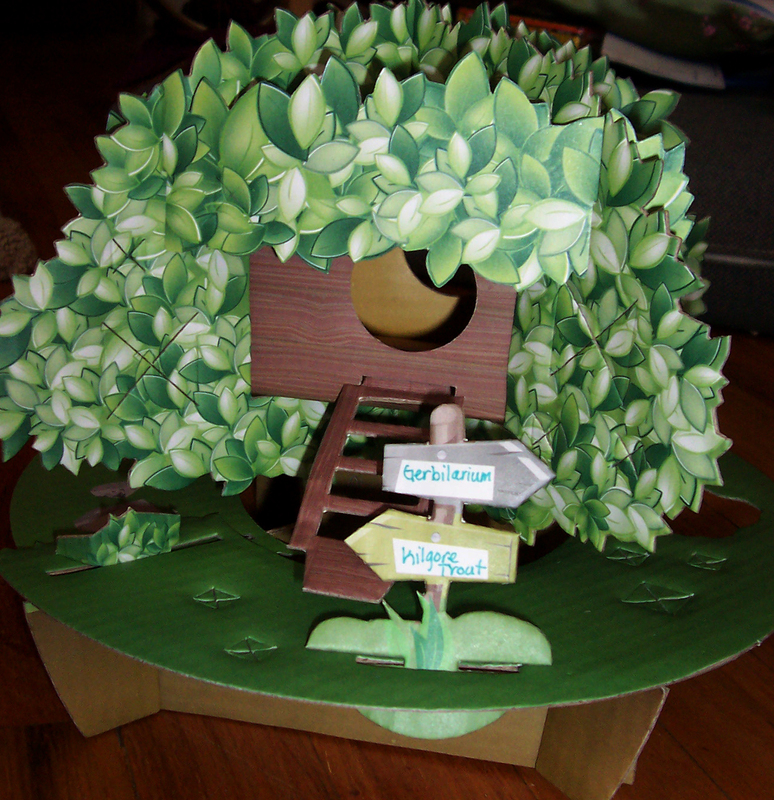 The Gerbil Tree House is 100% cardboard and fully chewable. Made from stuff tougher than the standard toilet paper roll, but not as hard or thick as a regular corrugated cardboard box, this Tree House has the feel of a classic shoe box with without all the gloss coating. Adding to the natural feel of the Tree House are six rocks**, and a tire, all chewable cardboard. If you need some evening excitement, the Gerbilarium is located within sprinting distance. Find a mate for the night, or for life! Many gerbils have left the Gerbilarium with 6-10 extra baby gerbils in tow. Known for it’s mazes of tubes and massive wheels that never go anywhere, the Gerbilarium doesn’t stop moving around. For some culture, head in the other direction into Kilgore Trout. The Museum of Trout’s popular permanent exhibits feature famous gerbils in history, including Aristerbil, Alexander the Gerbil, Clerbilpatra, and Gerblis Khan. This month’s featured temporary exhibits include the world-renowned Truth and Tails: Life during the Gerb Dynasty. The exhibit takes visitors back through time to the Imperial Dynasty of China. On tour from China, this exhibit is a must-see. The Museum of Trout is also featuring a fascinating look at Viking culture, with authentic relics once belonging to William the Gerbiller, Erik the Reddish, Ingvar the Fat-Tailed, and Brodir the Fierce and Furry. At this point, you may be asking yourself, “I’m a gerbil. How am I going to get to this fantastic tree house, conveniently located between the Gerbilarium and Kilgore Trout? The same Tree House all my friends are raving about?” Not to worry. Rodentia Travel Dreams has it’s own travel carrier. Get to the Gerbil Tree House in the safety of a gerbil carrying case, with the style only Rodentia Travel Dreams can offer. 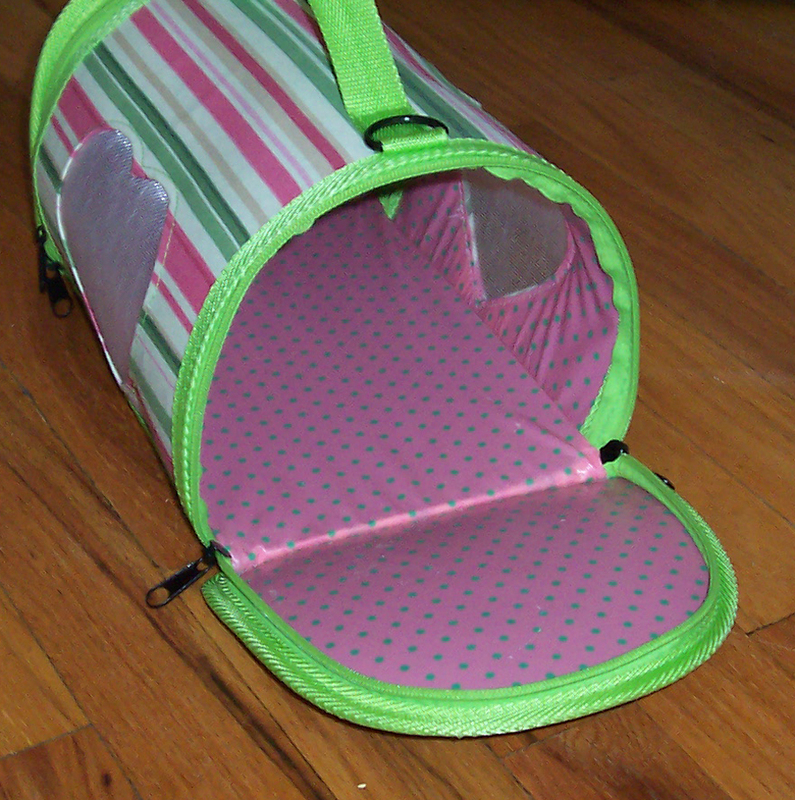 Our carrying case comes in a hip striped pattern of green, pink and cream. Inside, relax on the pink polka dot padded floor. And fear not—if you have an “accident,” the floor cleans up easily with a damp cloth. The heart-shaped windows allow you to enjoy the views from your carrying case as you travel to the most relaxing place on earth, exclusively for gerbils: The Gerbil Tree House. **rocks are not three dimensional.